ace futurism, ad mono, candara, carlito, comic neue, dosis, droid, expressway, ladybug love demo, lato, lauren, noto, pt sans, ropa sans, terminus, the happy giraffe demo, ubuntu, verdana. Please read the fonts.txt for more deatails. - added a custom entry in LSM menu "My custom font" to use a custom user font. - removed Calibri Fonts due license problems. Use Carlito as dropin replacement. Any possible way to get outline option added? How can I adjust the status text size? which font do you mean ? I think it is a problem related to the specific font you choose that has big numbers and relative small letters in the same size. For me the best solution you can find for you is to try to use another font because both size used in the portrait should be the same. Which core is related to status text? I want to delete this . So it is a problem to remove it. Last edited by Xanory : 09-18-18 at 11:19 PM. Last edited by Xanory : 09-08-18 at 11:27 PM. And thanks for the solution. Set two chars font differently, seems working, menu and all after login were different for these chars. No error message so far. Now all my char UI will look SO SLEEK! 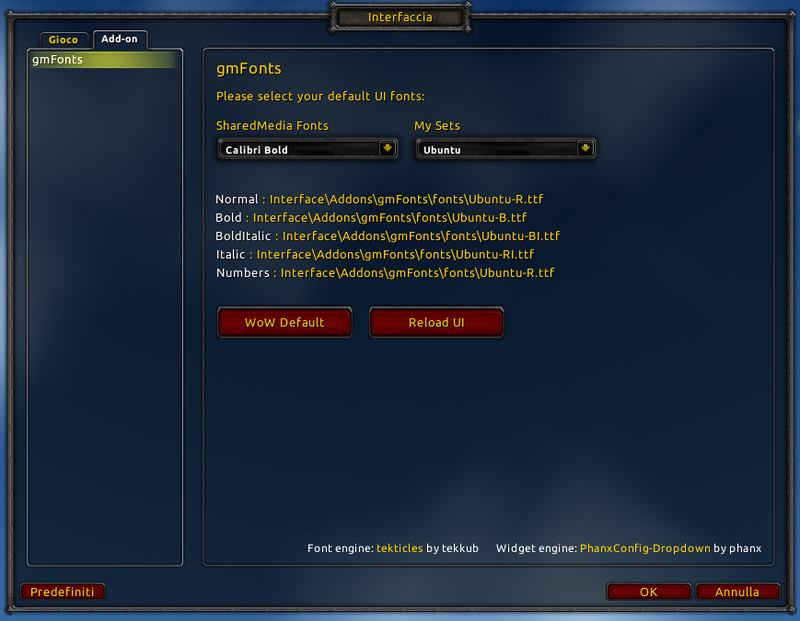 This is the only addon I've found to change fonts, it is one of a kind, thank you for this! One big issue for me: I badly need to retain the font setup PER CHARACTER PROFILE! How can I achieve that please? 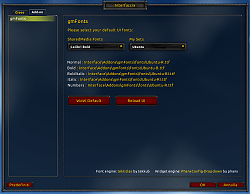 I use a lot of alts, I want to change their interface drastically, but if I use gmFonts, I have to change it log out log in in order to char name text to apply. 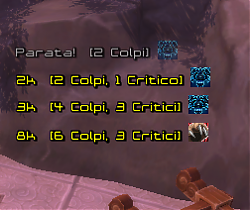 Would be insane good if the addon could remember the last set font per character? Any change...? That worked great, thanks! Am I able to comment out editing of the adventure guide as well? my chosen font seems to have made only the text in the guide very blurry. I am sorry but I think the guide use the standard font used elsewhere. I think you have to choose another font. 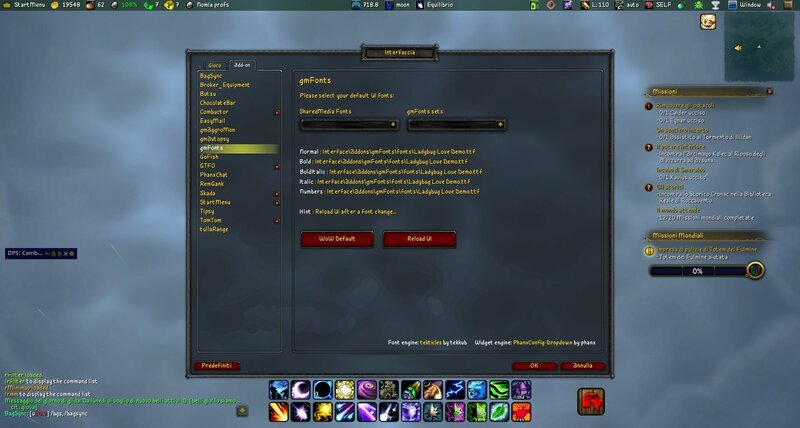 You can also use a custom font if the addon don't have a font that you like. "- added a custom entry in LSM menu "My custom font" to use a custom user font. To set the chat font. probably you succeded in your task. This addon seems to be blocking Prat from saving shadow (effect) on the chat font. I am seeing the same issues. I can set back the shadow again, but then this mod overwrites my changes. Is there a way to disable this just for chat? I added the Calibri font from Tekicles. Add four LSM lines, one menu line, and add to the menu entry list. Not too bad. Tekicles was throwing a single error in a loop so it was throwing it a lot. You can use the Carlito font that was in the addon, because it is a dropin replacement for the Calibri. "In 2013, due to Calibri's widespread use in Microsoft Office documents, Google released a freely-licensed font called Carlito, which is metric-compatible to Calibri, as part of ChromeOS...."